Hunting Clothes • What do you need? My First Choice for Hunting Clothes? When I first began hunting as a young man, the choices for moose hunting were limited compared to today’s overwhelming variety of choices. Back in those days the one lesson I learned very quickly was "No Cotton". Most of you have seen at some time one of those old fashioned lamps with a cotton wick. The wick lowered into the oil, draws the oil up out of the container to burn. Well cotton clothing will do the same. Wear cotton hunting clothes through the wet grass and very quickly you will find out just how well the wicking principle works. As an example, if you were to wear cotton pants and cotton socks the first thing you would notice is the pants leg would absorb a lot of water from wet grass. The next obvious thing you would feel is your pants would start to get rather heavy. You may have to tighten your belt? Let us hope you are wearing one! Now those wet pants will rub against your socks and presto, now you will have wet feet too! I have heard many complaints from hunters who will spent a couple of hundred bucks on waterproof boots only to hear them wail about how ineffective the boots were against keeping those feet dry. You can probably see where this is going already. Yes cotton socks. My best advice to you is to stay away from any cotton products, unless maybe you are hunting in extremely warm conditions such as you may find in Africa. From the no cotton years I evolved to using wool for my hunting clothes. Wool is a great product, the one thing you should always remember is wool is “warm even when wet” and is quite fire resistant. On the negative side for wool as a choice for hunting clothes is that once it gets wet, it becomes quite heavy. Another detriment for wool is once wet it can take a long time to dry. 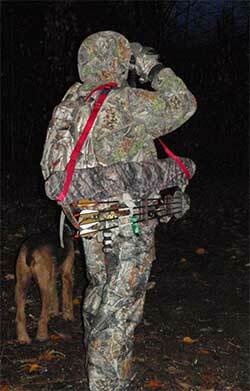 Once hunting clothes made from fleece came along and I had a chance to try them, I switched and have not looked back. Polar fleece or its more common name of fleece was first invented in 1979 but did not really start to become popular for outdoor gear until the early 1990’s. Fleece is commonly categorized into weights or thickness from micro fleece the lightest, 100, 200 and 300 being the heaviest. Fleece unless treated with a fire retardant is quite flammable. I can attest to this because I own quite a few fleece garments and I do not think that any of them have escaped the spark from a camp fire. One of those embers no matter how small will melt a hole upon contact. Fleece as part of your hunting clothing, or dare I suggest as all of your moose hunting clothing when worn in layers is probably the best you can hope for in keeping warm and dry. Fleece is a non-absorbent fabric and highly breathable. Therefore when worn by those who exert themselves the moisture will be wicked away from the skin leaving the wearer warm and dry. I suppose there always has to be a downside to every product and in this case fleece is no exception. Fleece as mentioned before is flammable and because of its breath-ability it is not wind proof. It can generate a lot of static electricity, my dog hates that; the spark from my finger to his nose when he comes to great me... poor guy! Here is a list of some of the fleece and Polyester hunting clothes I own. I wear merino wool socks with polyester liners. The liners wick the moisture away and the wool keeps my feet warm. I have found the liners invaluable in reducing blisters which can often be caused by having damp feet. The liners also have the effect of giving a sliding surface between the sock layers; this also reduces the incidence of blisters. Another very important component of your hunting clothes is the hunting or hiking boot. For moose hunting you are almost always going to be hunting in wet areas so you need to find a boot that will offer warmth for the cold and waterproofness to keep dry. There are of course some very good manufacturers out there such as Rocky and Irish Setter. Go outside, stay warm and dry and most of all, have fun.